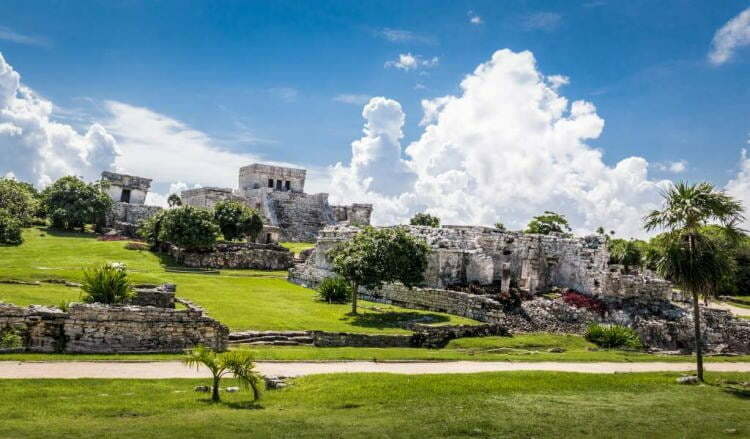 It’s not just natural wonders and archaeological sites that have drawn people to Tulum. This coastline town offers an exotic getaway from the Cancun hustle. It’s so relaxed, it’s known for its new-age yoga culture. The seaside views are exceptional, and for beach bums, there’s no place better than to lounge around and soak up the sun. With swaying palm trees and soft white sand stretching for miles in each direction, it’s a literal postcard paradise. When it’s time for something new, why not explore a one thousand year-old Mayan ruin that sits atop a cliff overlooking the turquoise waters of the aptly named, Paradise Beach. Labeled a world heritage site by UNESCO, nighttime visitors can gaze up at starry skies and take in some of the most photogenic scenery, in one of the most beautiful regions in the entire country. For those wishing for more adventure. many beautiful cenotes are scattered nearby within easy reach. The town itself is also home to a great variety of food restaurants, and they even have a thriving nightlife too. Due to its small-town nature, many shops and restaurants only accept cash only, so do keep some on hand. If you want to visit Tulum the best time to go for perfect weather is December through April. Between May and October, it’s turtle time and these guys frequently arrive in the thousands to lay eggs on the sandy shores.